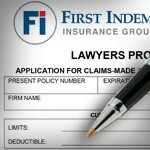 To prepare and submit your application for First Indemnity's Lawyers Program, you may select one of three submission formats. To complete and submit your application electronically from the website, choose "Online Application Form". To complete a fillable PDF form, select "Download Fillable PDF to Your PC" ". If you prefer to download a simple PDF application to complete offline, choose "Downloadable Static PDF".